Ryan Gosling is the hot new guy on the Hollywood scene, and this was no more evident than on the set of the 2011 movie Crazy Stupid Love. Gosling’s Jacob Palmer, a successful womanizer who manages to bed women with ease, was nothing if not stylish, and in the months since the release of the movie there has been plenty of interest around the web from guys who want to emulate the look (and at least a few who want to ape his personality). We’ve already written about the wildly popular necklace Gosling wears in Crazy Stupid Love, but it seems there are just as many people eager to discover what kind of sunglasses are worn by Gosling in the movie. Well, if you’re looking to buy a pair for yourself you’re bang out of luck for screen accuracy. Gosling’s sunglasses are a pair of vintage Selima Chad shades, and the modern replica tortoiseshell frames made by Selima are truly awful – cheap construction, styling changes and a silly price tag designed to part fools from their money. However, if you’d like the look you can get a fantastic pair in the same style for a hell of a lot less than the $375 Selima are asking for (even for the God awful electric blue frames they’re currently trying to palm off). 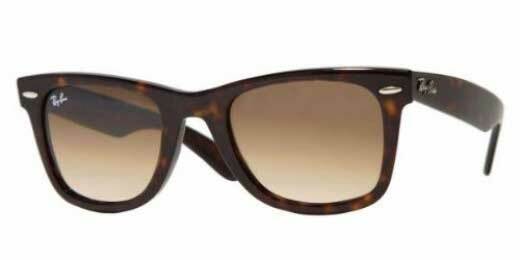 Selima Chads are modeled on the evergreen classic Ray Ban Wayfarers, a brand and style close to my heart. I bought my first pair of Wayfarers many, many years ago on a duty free store at a UK airport, and promptly left them in a Bangkok cab two days later. Since then I’ve gone through a regular cycle of purchasing and losing pairs – I must have bought a dozen pairs in my time, and while I always misplace them I haven’t gone more than a week with a pair in my bag for twenty years. I can only afford to replace my lost pairs as Ray Bans are so affordable – a pair of tortoiseshell frames as seen in Crazy Stupid Love can be snagged for as little as $100. While Ryan Gosling’s sunglasses may not be Wayfarers they might as well be. The sleek, solid frame of the Selimas are almost identical to Wayfarers, with the Ray Bans bringing the added value of quality construction and a half century of heritage to the game. I’ll stop now before I start gushing too much about the brand, but before I go I’ll say that a man’s accessory collection couldn’t possibly be complete with a pair of Wayfarers (check out the hundreds of glowing customer reviews). God, just look at ’em. Beautiful. Steve Carell and Ryan Gosling were so amazing in this movie! I thought this film would be predictable, but I was so wrong. It’s funny, sweet, and touching even, anyone who’s every loved will love this film. Ryan Gosling looks super hot in the movie and I just melted seeing him wear this sunglasses. I’m going to get the $100 tortoiseshell frames one and give it to my husband for his birthday. This way I take the care of the gift and at the same time I can think of Ryan Gosling every time my hubby wears the sunglasses. I also have a really hard time holding on to sunglasses, so I don’t even really bother buying them. I probably should though, to protect my eyes… Those old Selima’s look fantastic, but unless Selima steps up it’s game by a lot, I wouldn’t consider them. They charge way too much for a cheap pair of glasses! The Ray Ban’s are close, but they’re not really exact… has anyone seen anything that comes a little closer? I love these glasses and would love to see my husband in them. The only problem is that he always breaks his sunglasses, especially the more expensive ones. I may have to give him these and make him swear that they last at least 6 month. This movie was so good I laughed and cried it was perfect.